Heart of the Story: Joel was a prophet in the Southern Kingdom (Judea). 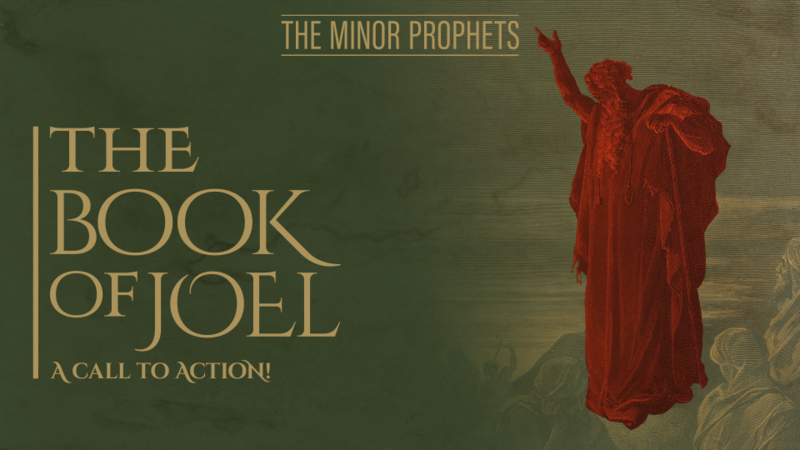 Joel was categorized as a Minor Prophet and his book is placed second (between Hosea and Amos) among the 12 Minor Prophets. Joel is a short three chapters. Back Story: Controversy surrounds when Joel was written. Probably the controversy resulted because the book is divided into two distinct parts. In the first part (Joel 1:2-2:17), Joel described Judea being invaded by locust. From this perspective Joel was written during the locust plague early in the divided kingdom period. In the latter portion of his book, Joel (Joel 2:18-3:21) delivered a prophecy about the restoration of Judah and God’s coming judgment on all nations. Because of the language in this prophecy, some scholars believe Joel lived concurrent with Jeremiah or even after the restoration of Judah. My perspective was that Joel was written during the reign of King Joash (835-796 B.C.) or early in the reign Uzziah (792-740 B.C). Story Line: Most scholars agree that Joel wrote about an actual scourge of locust into Judea. Joel’s descriptions of locust movements are graphic and accurate. The locust devastated the harvest and ruined the land. Field crops were destroyed with grains and vines eaten; plants that remained dried up. New seeds did not germinate; they shriveled beneath clods of dry soil. Because there was no fodder or pastures, cattle milled about and moaned in discomfort. Even the sheep suffered from lack of food. Fig trees were stripped of their bark as well as fruit, leaves, and stems. All the trees of the fields dried up. The year the locust invaded Judea was a horrible year for most Judeans. Many suffered from inadequate food and nutrients because Judean agriculture was destroyed. Likely imported foods were scarce and/or costly. Even in subsequent years, the nation’s food supply was reduced. Seeds didn’t germinate during the locust year; consequently, no seeds were available to plant the next growing season. Farmers and families would have to buy seeds from other nations. Trees and vines were damaged or destroyed. Heavily damaged trees take years to recover; e.g., to grow new branches and produce fruit. Pondering Relationships: Joel was focused not on the locust plague, although he define it and its effects. Rather Joel focused on God’s love despite the locust plague. According to Joel, the dire problems of food security that came about because of Judah’s sins, God loved his people and reassured them. God promised “I will repay you for the years the locust have eaten – my great army that I sent among you” (Joel 2:28). This verse tells each Judean and each of us that God will restore the times/years that we wasted living far from him. The children of Judah and we have a part in this restoration. Our part is to turn to God with our whole heart; to rend (tear or break) our hearts because of our sins (Joel 2:12-13). Reflection: Wow, I have a hard time trusting and turning to God in the midst of hard times. What about you — can you believe that God will restore the wasted years? This entry was posted in Prophets and tagged Carolyn Roth Ministry, Joel, Lesser Known Bible Characters, locust scourge, Minor Prophet, Obscure Characters, Old Testament. Bookmark the permalink.